Screenshot via Elon MuskThe first production Tesla Model 3, unveiled by Tesla CEO Elon Musk, July 8, 2017. 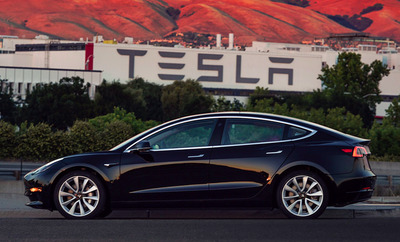 Tesla will launch its long-awaited, $US35,000 Model 3 sedan in California on Friday. At CEO Elon Musk’s electric carmaker, the first 30 vehicles will be delivered to Tesla employees at the company’s Fremont factory. The arrival of a new four-door would ordinarily be a ho-hum event in the auto industry. But the Model 3 is anything but ho-hum. It’s Tesla bid to quintuple sales by 2018 and take them to a million by 2020; last year, the carmaker didn’t even deliver 100,000 cars. The Model 3 is also key to vindicating Tesla’s relatively titanic market car, some $US50 billion, making it larger on that basis than Fiat Chrysler Automobiles, Ford, and at the time in 2017, General Motors. 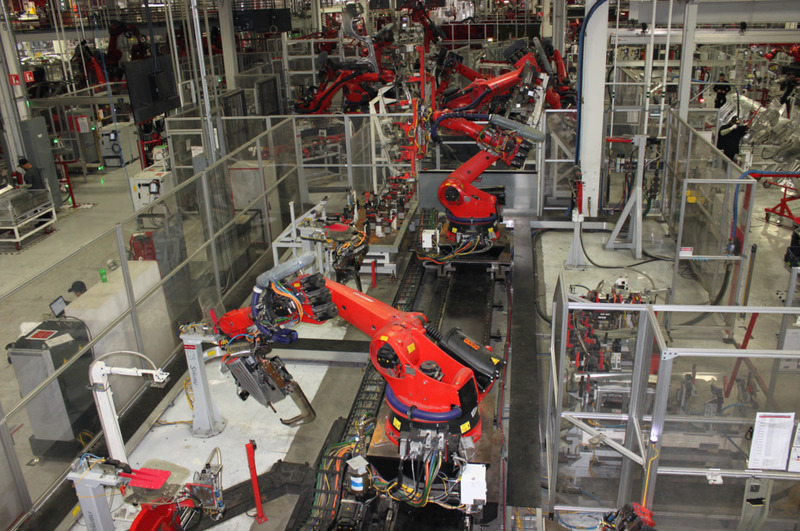 Since its 2010 IPO, Tesla has turned in two profitable quarters. The Detroit Big Three, meanwhile, have posted steady profits for years and spent the past two years raking in cash amid an SUV-and-pickup-truck powered sales boom in the US. Tesla has been superb at crafting a high-tech, futuristic story, born of Silicon Valley values and served up by the charismatic Musk, a 21st-century hybrid of Walt Disney, Henry Ford, Steve Jobs, and Howard Hughes (with some Preston Tucker thrown in). The story has propelled the stock to epic levels. 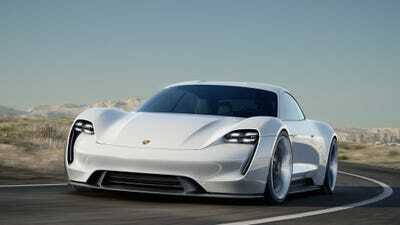 The more mundane aspects of building cars has been another matter. Both the Model S and Model X — Tesla pre-Model 3 lineup — were delayed and endured a lot of production problems. Tesla has been around for 13 years, yet the company continues to struggle with fundamentals. The company could have more than 500,000 pre-orders for the Model 3. Any other major automaker would have seen that number and kicked a factory into gear, rolling cars in short order to bring in the cash. 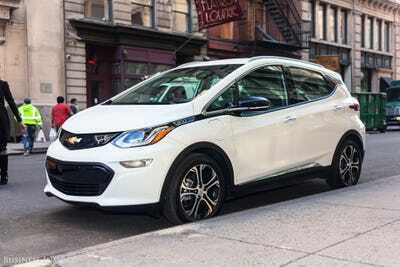 GM debuted its own long-range EV, priced about the same as the Model 3, in 2015 and was sending vehicles to dealerships by late 2016. The pressure is now on for Tesla, a carmaker that’s never wanted to be like anybody else, to hit its marks in this critical, old-school area. YouTube/Motor TrendAn earlier look at Model 3. Tesla started out by selling $US100,000 cars to a well-heeled elite. 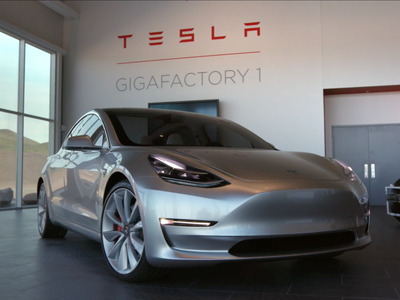 Even though the Model 3 may be priced closer to $US50,000 than $US35,000, once it’s optioned up, Tesla is still moving in the opposite direction of fat profits. Smaller cars make less money, and so do mass-market vehicles, compared to luxury ones. There’s an argument that Tesla makes a healthy margin in the Model S and Model X, but because the company always loses money, that margin is sort of academic at this point. Additionally, the Model 3, with its production, engineering, and launch demands, will gobble up much of Tesla’s current cash and future operating profits. So it’s vital that the vehicle eventually achieves both profitability and volume. 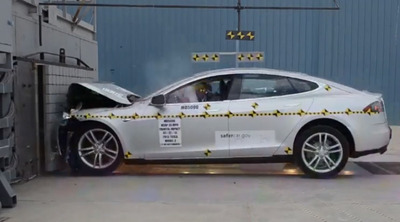 YouTube ScreenshotA Tesla Model S undergoing crash testing. Tesla has been hit by some notable recalls over the years, but so few of its vehicles are on the road that it hasn’t made a huge difference. Recalls are a routine thing in the car business, but any Tesla recall garners outsized attention. 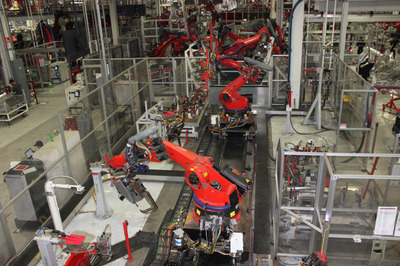 The company has set itself up for a Model 3 recall by skipping a production prototyping stage and going directly to mass-production (the prototyping stage validates the assembly line and ensures that production will be smooth and efficient). The cars will hit the streets and could appear in significant numbers by mid-2018 if Tesla’s ambitious production ramp is a success. But due to the rush, the recall watch will be on from the get-go. Nobody else in the car business is really launching a new sedan. The market in the US has shifted to SUVs and crossovers, so automakers are furiously expanding that aspect of their offerings. As with the Model S, another four-door, that came out before the Model X SUV, Tesla is launching the Model 3 sedan ahead of the Model Y crossover, a vehicle that might not show up until 2020 or later. Tesla’s pre-orders suggest that there’s plenty of demand for the Model 3 — but the risk there is that we could be talking about Tesla demand, rather than vehicle demand. Following on that point, Tesla has thus far enjoyed a great deal of Tesla demand — people want its cars because they want to be part of its story. But Tesla has also had the all-electric market pretty much to itself. For 13 years. And it hasn’t been able to make money. Because EVs only amount to about 1% of global sales. 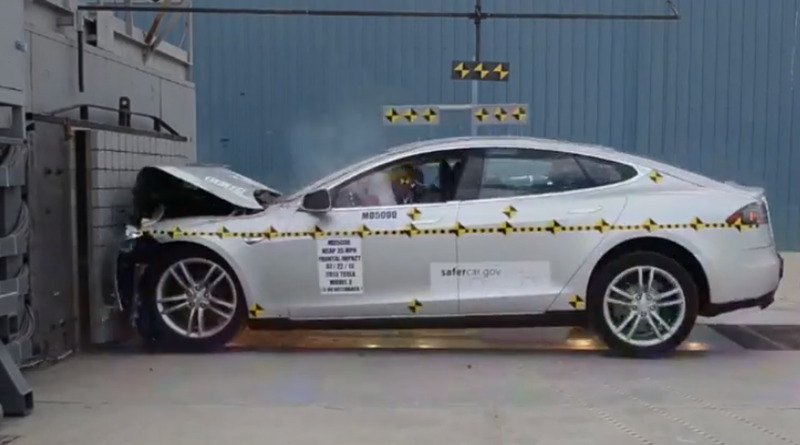 The bigger carmakers have been happy to let Tesla take on all the risk. Only now are they starting the bring out competitive vehicles, and as GM demonstrated with the Bolt, they can roll out a car that’s Tesla-competitive in short order. Musk is happy about this — he never wanted to go it alone and is playing a long game, called “save the planet.” But the era of Tesla watching is now over; the era of Tesla beating has begun. As exciting as the Model 3 arrival is, it’s only Tesla’s third car. If you want to buy a Tesla, you don’t suffer from an abundance of choice, and the debut in September of a semi-truck design isn’t likely to help. Tesla somewhat solves this problem by offering different battery configurations, rear-wheel and all-wheel-drive variants, and juicier levels of performance. But segmentation is a challenge. A Ford, GM, Toyota, or Honda, will each sell you one of a half dozen crossovers, from diminutive to quite large, with lengthy options lists and varying levels of luxury, from bare-bones to high-end. So Tesla needs to add to the Model 3 lineup and do it fast. Tesla also needs to avoid relying on refreshing ageing platforms. The Model S is getting long in the tooth, and while over-the-air software updates might add capabilities, a redesigned vehicle has to come someday. That day will also come from the X and the 3. All eyes will be on Tesla this week as the Model 3 gets real. But when it comes to the risks, the real work has truly just begun.